Picture this. You plan to run a half marathon. You spend months going for a run every day. You hit the gym. You watch your diet. You stick it out no matter how hard it gets and even your cheat days are few and far in between. And then finally, you think you’re going to kill it at the marathon only to be surpassed by a dog who doesn’t even know what she’s doing. 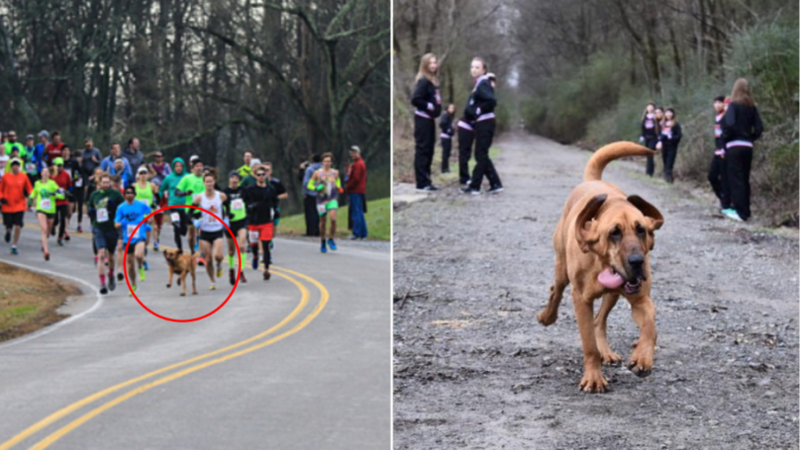 Runners at Canada’s Elkmont Trackless Train Half Marathon saw these fears come true when Ludivine, a two-year-old Bloodhound accidentally ended up being part of the race when she came out to relieve herself. She squeezed her way through a garden fence and went towards the starting point at full speed and that day, Ludivine made history on January 17th, 2016, albeit unintentionally. While Ludivine didn’t manage to win the race, she came in a respectable seventh and it is only because she didn’t even try. Two miles in, she took a break to inspect a dead rabbit which was lying close to the track. She was so easily distracted that she kept veering off course and some onlookers even reported that she stopped to have some fun with a herd of cows which were grazing along the way. As unbelievable as it sounds, she was just that fast and clearly unstoppable and she only took about an hour and thirty minutes to complete the entire 13.5-mile run. 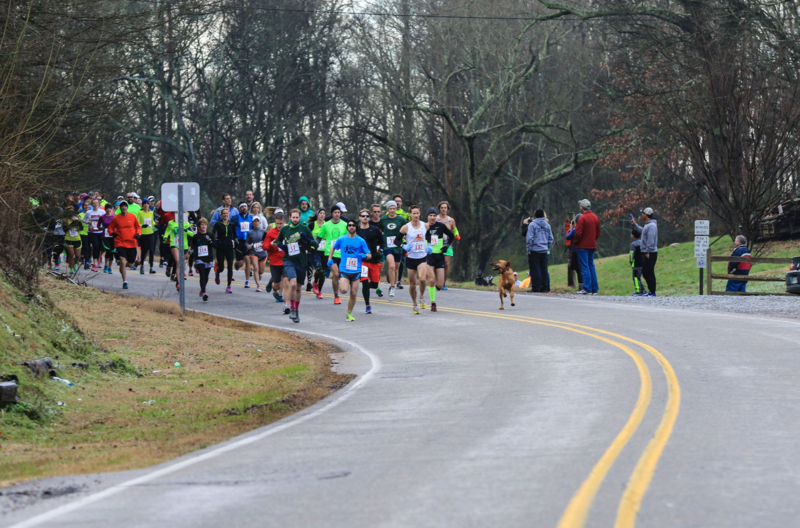 If you want to see some beautiful pictures of the event, just pop by Elkmont’s Hound Dog Half’s official page on Facebook. Going through the photoset is surely going to make your day, especially if you’ve had a bad one. Ludivine’s pictures and the sheer excitement on her face as she runs is enough to lift anyone’s spirits. And, of course, Ludivine was recognized for her prowess and for being such an adorably good girl in general. She got a medal for coming in 7th, in what was honestly an amazing race. According to April Hamlin, the proud doggy mama, all she had to do was open the door. Ludivine just ran the race because she felt like it. At first, 41-year-old April was scared as she feared that Ludivine would make it difficult for the people actually participating in the marathon, but the positive response has been very heartening. Ironically, Ludivine is also a very lazy girl. She prefers to live a chill life and she loves making new friends and so, April was as surprised as everyone else that she actually managed to finish the entire half marathon. One of the participants in the event, Jim Clemens (who gained the fourth position) described his own experience of running with Ludivine. Whenever he figured that she’d become tired and dropped out, he would see her racing up to the front of the line. Every now and then, she’d go play in the water or run into other people’s gardens just to explore. We’d just like to congratulate Ludivine on her amazing run. She’s also given us all a very heartwarming tale and for that alone, we’re thankful.
? Indoor ‘Ferris Wheel’ Garden Grows 90 Plants At Once, Year-Round Long Vanished Eastern Puma That Was Driven To Extinction By Humans Added To Extinction List ?